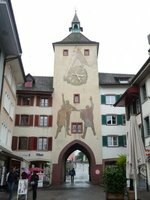 Since we are in Switzerland already, here is another… Liestal is a pretty, innocent-looking little town in the surroundings of Basel, capital of semi-kanton Basel-Land. 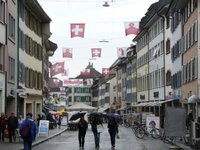 Like almost everywhere in Switzerland, the old town has survived the centuries unharmed and preserved its historical charms. A peaceful place, it seems. However, this is just the facade. 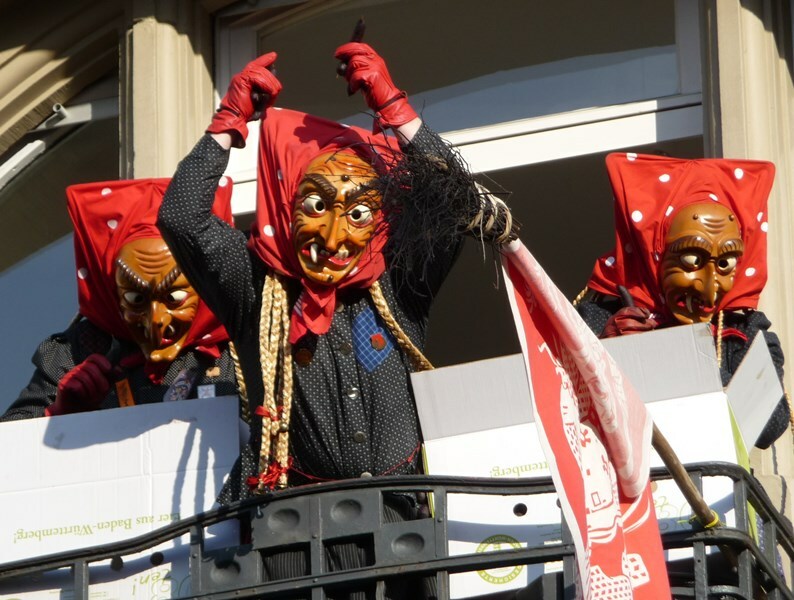 Once per year the citizens of Liestal show a different side of their faces and turn their town into the Front Yard of Hell. 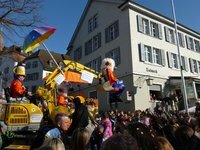 The carnival is what Liestal is most famous for. 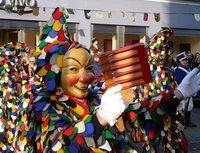 They have their parade with masks and colourful costumes and confetti yadda yadda in the afternoon, but after nightfall the real thing starts. 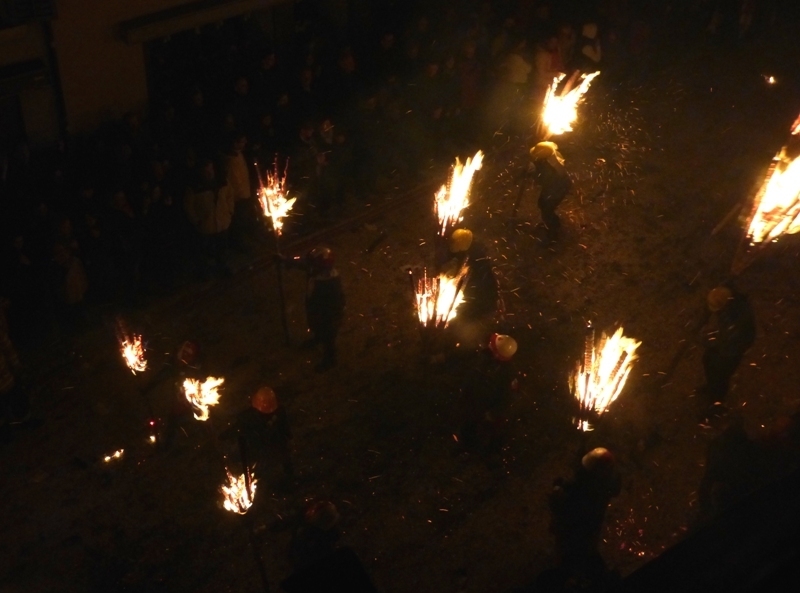 The main event of their carnival, called Chienbäse, is a fire parade. 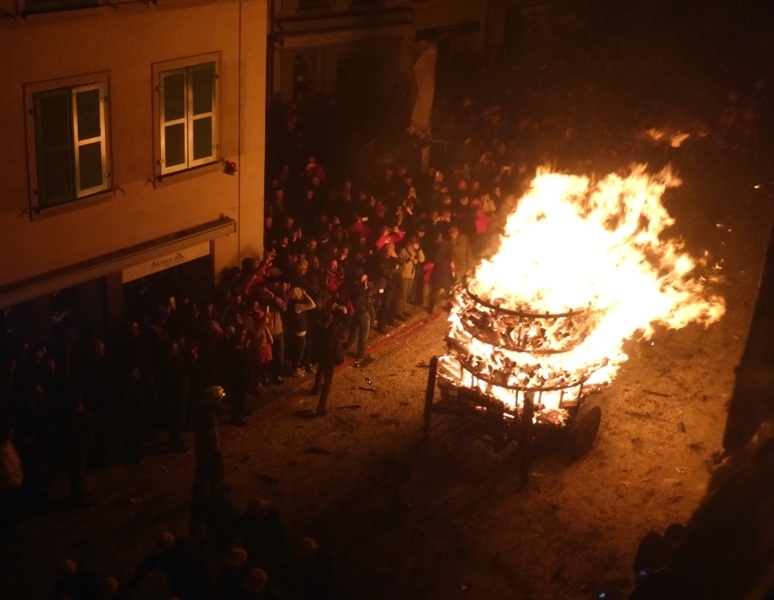 "Broomsticks" of burning wood are carried and iron wagons loaded with blazing piles of logs are pulled through the narrow main street of the old town. Scary, and quite something to watch!!!! The parade on Sunday afternoon, i.e. 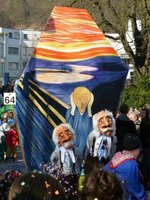 Sunday after Ash Wednesday, is a colourful event with many masked groups, some wagons, lanterns and Sujets, Guggemusik bands, drums and flutes. 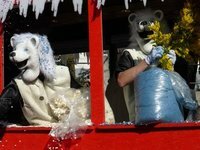 Bags full of Räppli (confetti) and goodies, flowers, oranges are thrown to the spectators - in other words, it is a smaller version of the Cortège parades in Basel, in similar style and with similar masks and outfits. Visiting with children is no problem at all, there are no safety issues (except getting lost in the crowd or being hit by a flying orange). 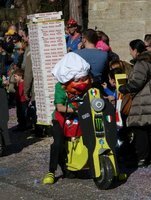 It starts around 2 p.m. and will take a couple of hours to pass through the streets of the town. 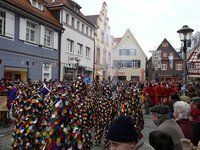 In bright sunshine everything appears pretty and harmless, but this event is just the prelude for the main one, the "Chienbäse" fire parade after dark. The cliques with the big lanterns will make another appearance in the evening. 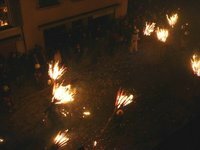 The main event in Liestal's Fasnacht is the fire parade, named Chienbäseumzug after the Chienbäse, the burning brooms made from pine logs that are carried through the old town. 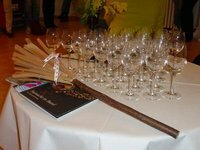 It takes place on Sunday after Ash Wednesday in the evening, in other words: the night before Morgestraich in Basel. If you don't mind getting little sleep you can easily combine both events. 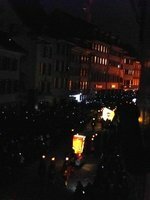 The cliques with the illuminated big lanterns march at the beginning of the night parade. 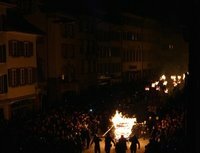 However, they play a secondary role, unlike in Basel, because everyone is waiting for the fires to come. From afar you can already spot the shine reflected on the facades and in the windows of the houses and tension is rising. 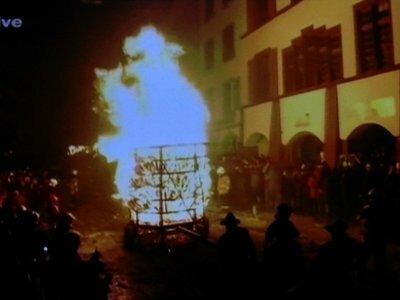 The parade involves around 300 Chienbäse and some 20 iron fire wagons and baskets. 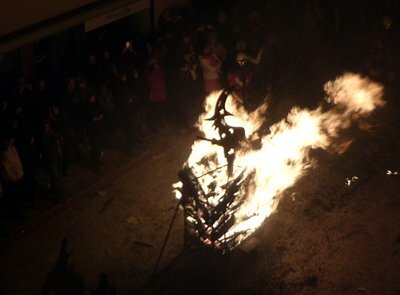 It is really something, an archaic spectacle (although it is just 110 years old), scary and impressive at the same time. 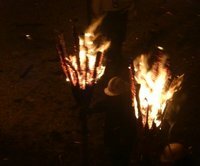 The burning brooms are carried on one shoulder. Each of them weighs between 25 and 100 kilograms. A look into the faces of the carriers shows how hard it is to carry them. They wear helmets and protective jackets, but they are nevertheless glad to have some water poured over them by the firemen at every stop. You'd think this is the kind of dare that young guys do, but there are people of all ages participating, men and women. 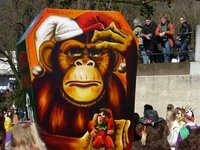 The most spectacular element of the parade, however, are the fire wagons. There are more than 20 iron wagons loaded with piles of pinewood logs that are set ablaze. 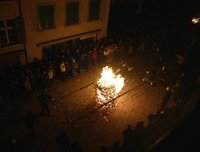 They are pulled by 10-16 people and their flames go as high as the roofs of the houses. 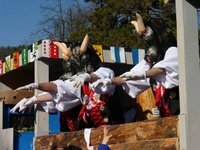 They cause an immense heat, and when they stop the spectators have to duck and cover up. 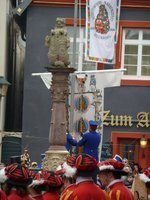 The parade enters the old town through the gate underneath the Törli, the medieval gate tower. In between the groups, the fire brigade gives the interior of the passage a thorough shower with three or four hoses to keep the wooden parts wet and prevent any smouldering. One wagon will stop after passing the Törli, be pushed backwards through the gate tower and pulled back in. 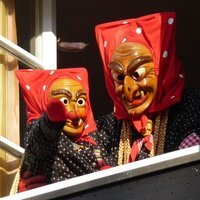 These are the Törli-Waggis, the one and only group that have the privilege to pass the gate three times instead of only once. 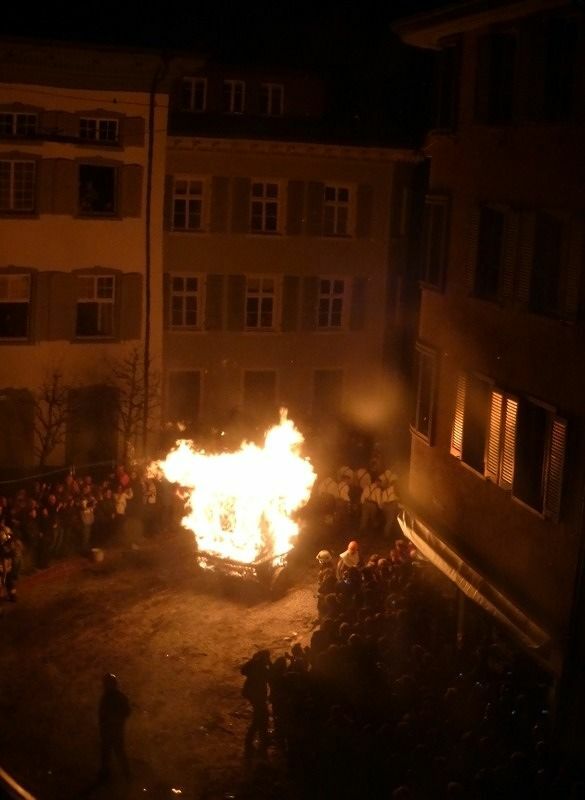 When: Sunday after Ash Wednesday, the evening before the Morgestraich in Basel. Start is at 19.15 - be there in time. 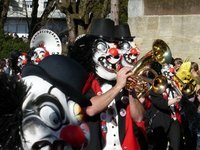 Thanks to the date and the frequent train connections it can easily be combined with a visit to Morgestraich in Basel if you don't mind getting little or no sleep that night. 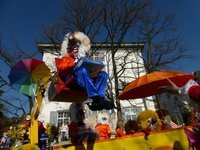 Where: Start and lighting of the brooms and wagons is at the upper end of Burgstraße. The route goes along Burgstraße through the Törli (gate tower), along Rathausstraße, the main street of the old town, then up Rebgasse and Gerbergasse to Gestadeckplatz. 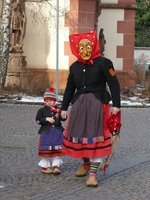 See the map on the website of the Chienbäse-Verein. 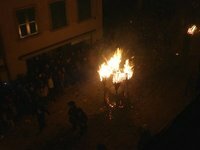 So far they have not managed to burn down their town, LOL - in fact, Liestal is the fire-safest place in the whole area that night while the rest of the semi-canton would be in deep trouble if a fire broke out elsewhere. All fire brigades from near and far are on duty in Liestal. Every 50 metres there is at least one fireman with the hose ready. They know what they are doing. I spoke to a lady who works for the municipality and used to be in charge of security. She said they are sure that fire protection works. If anything or anyone started smouldering the fire would be put out within seconds. 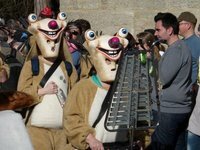 There is only one apparent danger that they really fear: an outbreak of panic among the spectators. I do not want to imagine the mess that a panic would cause. The spectators ought to know what they are doing, too. 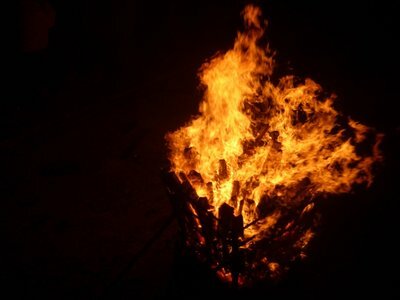 Ask yourself honestly whether you have the nerves or not to withstand being so close to the flames, among heat and smoke and flying sparks, squeezed into dense crowds in a rather narrow street with a solid house in your back and nowhere to run. If your answer is yes - welcome to the adventure. If you have the slightest doubt, do not enter the old town but watch the parade at the beginning or the end where there is more room. Please read the safety rules. 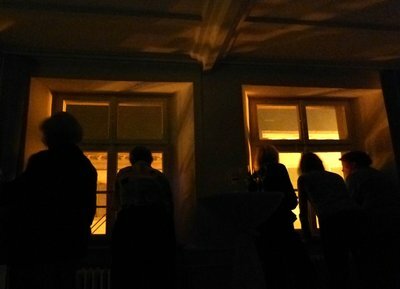 Watching in Rathausstraße is not for the faint-hearted. You would not get me in there even if you offered me a million Swiss Francs - no way. 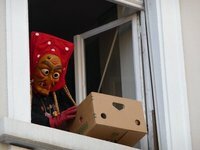 Thanks to local friends who organized our visit we were able to watch from a room on the third floor of a house, but even behind closed windows we felt the heat of the fires. These safety rules are published on the web in German and French. I am translating them into English here, as these are really important to know. Please take them seriously. 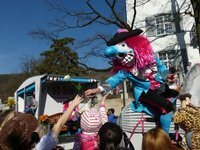 - Keep enough distance from the fire wagons and the broom carriers. - Keep a strict eye on children. 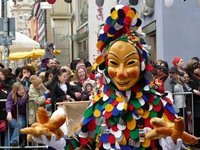 Especially with children it is recommended not to watch the parade inside the old town but at the end of the route (Rebgasse, Gerbergasse) where there are fewer crowds and more space. 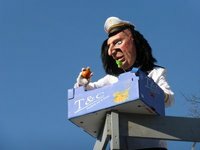 - Children under 6 may watch the parade only from a distance outside the parade route. - Children under 12 must be accompanied by a parent. - Children do not belong on the shoulders of adults. The heat is much worse up there. - Firecrackers are strictly banned. 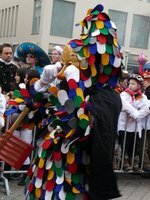 - Stay on the sidewalks, do not cross the street during the parade (because the ground is full of embers). - Taking photos in the street is dangerous because it is hard to estimate distances through the lens or display of a camera (and your attention is focused in one direction and you don't see what is going on behind you). - Make sure you know where to find an escape route in emergency. (Tricky one, because there are very few side lanes and the crowds block everything). Tuesday afternoon in Offenburg is nourishing indeed. 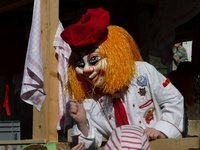 The main event is called „Hexenfraß“ (Witch Food). 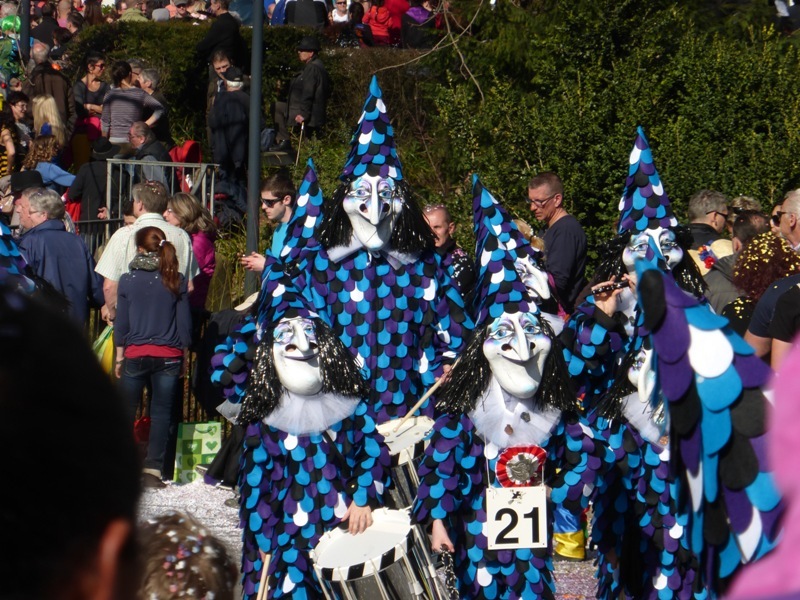 The local witch guild feed children and also big people with smoked sausages and rolls. 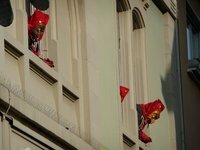 These are thrown down into the crowd from the windows and balconies of the houses around the main square. 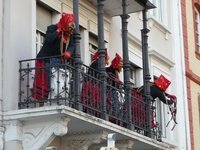 So the guild members picked up their courage and their masks and outfits, dressed up inside the houses and made their appearance in the windows. The French military had enough sense of humour to accept and respect their chuzpah. The ban has obviously long been lifted but the witches keep up the custom. 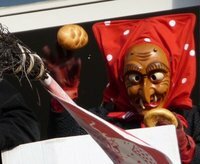 Offenburg is the birthplace of the Witch as a figure in the Alemannic Fastnacht. 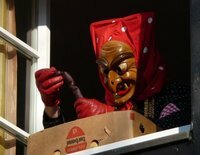 In 1933, not earlier than that as explained above, the first witches appeared in Offenburg’s parade. 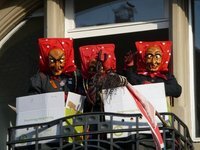 Three years later, in 1936, the first witch guild (Hexenzunft) was founded in Offenburg. 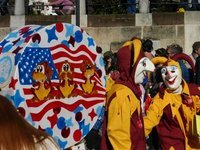 In other words, in the middle of the Nazi era, which may explain why the post-war French government was so restrictive about the street carnival. 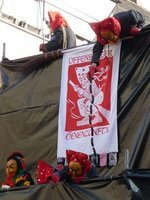 There is another, older guild in Offenburg that call themselves „Althistorische Narrenzunft“. 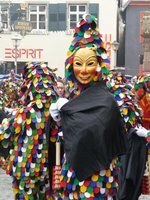 Their main figure is the Spättle, a colourful figure covered in little patches of fabric from head to toe, sporting a laughing face. 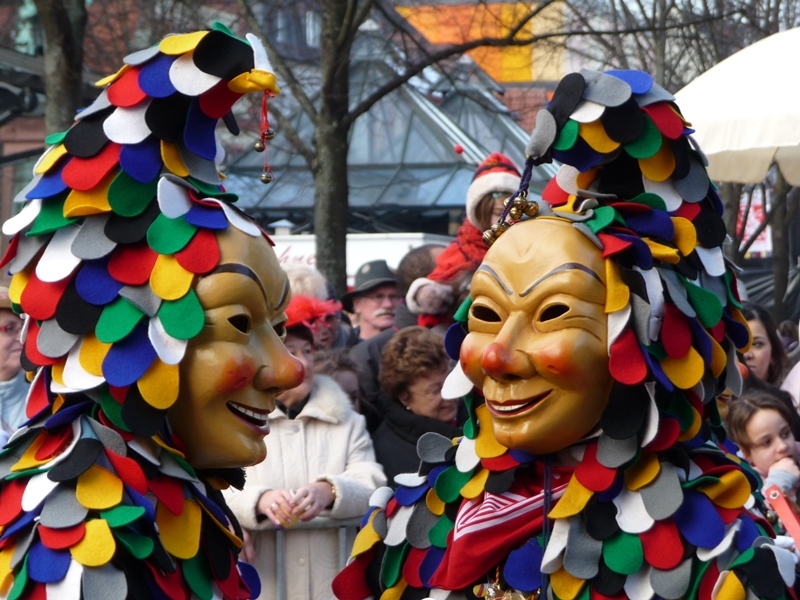 The guild also includes a (mock-)military guard with a miniature cannon, the military brass band, the „Alde“, i. e. Old Offenburg Lady in Biedermeier dress and a painted textile mask, the black Dominos, and a couple of single figures. 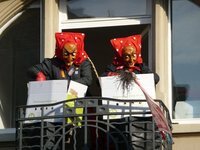 They make their grand appearance, marking the end of the street carnival, right after the witches have fed everyone and retreated from the windows. 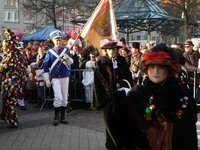 Then the Althistorische march in and assemble for the Funeral of the Fastnacht. 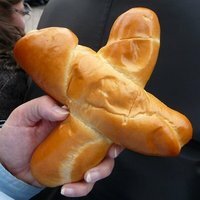 First they hand out sweet buns in the shape of a cross to the spectators. Then comes the sad part. The Spättle put on black cloaks and everyone is very very sad while the final speech is done and the jester flag taken down.